YU Yunique an ultra budget device launched last year with pure Android was promised a Cyanogen OS upgrade but despite it being more than six months since the announcement there is no sign of Cyanogen OS ROM for Yunique. However if you're tired of waiting for the same CyanogenMod community has once again is to your rescue with the Android Marshmallow based CyanogenMod ROM. Thanks to xda-forums member DC07 you can now install CyanogenMod based on Android Marshmallow to your Yunique. 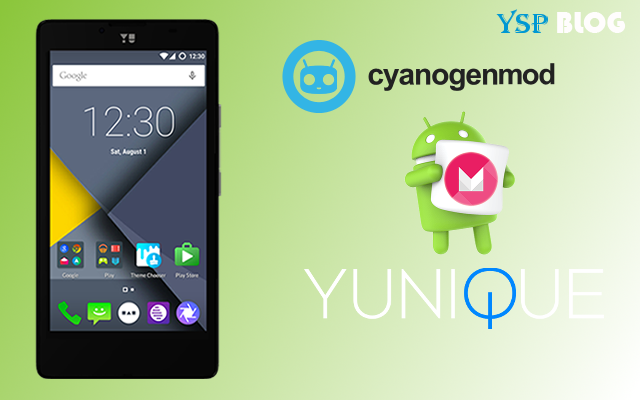 If you are comfortable with tinkering your device below is the details on how you can run CyanogenMod on YU Yunique. Verify the installation of recovery by holding the Volume Down and Power buttons and check whether it goes into recovery or not. In Team Win Recovery Project, select menu choices by tapping on the appropriately labelled button. Optional (Recommended): Select the Backup button to create a backup. Select Wipe and then Factory Reset. Select Install (if you're running Cyanogen recovery this is Apply Update). Navigate to /sdcard and select the CyanogenMod .zip package. Follow the on-screen notices to install the package. Optional: Install any additional packages you wish using the same method (if you are installing multiple packages, install CyanogenMod first and then install any subsequent packages on top of it). Once installation has finished, return to the main menu and select Reboot, then System. The device will now boot into CyanogenMod. Note: Installing a custom ROM on your device may result in loss of data or accidental bricking of the device so we urge our readers to kindly read the instructions carefully before attempting to install new ROM. Also don't forget to take complete backup of your device just in case.